This traditional pocket transit is not short on anything, except price. 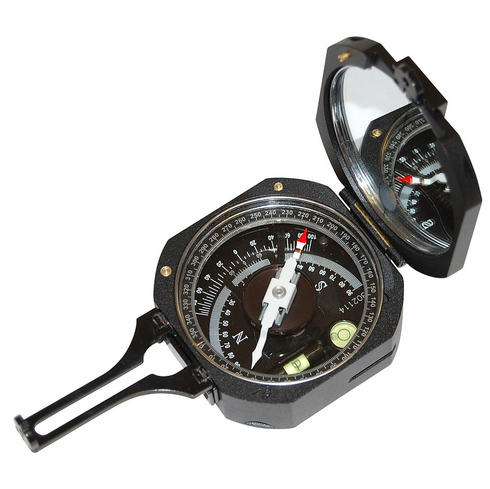 This durable cast aluminum transit was designed for the specific tasks required of geologists, surveyors, mining engineers, civil engineers, environmental engineers and foresters. The solid cast aluminum body and lid provide durable protection to the 0-360 degree azimuth scale of this precision instrument. The direct-read compass capsule of this transit features 1 degree resolution and 1/2 degree accuracy. And the dry compass capsule of this quick dampening needle features both a needle-lock to protect the compass assembly during transit and gear driven adjustable declination to allow for simple compensated bearings. The vertical angle clinometer scale featuring 1 degree increments has a range of ± 90 degrees or 100% grade scale with an accuracy of ± 1/2 degree. A percent grade scale features increments of 5%. Overall Weight (without the case): 8.7 oz. See ALL the professional pocket transits.